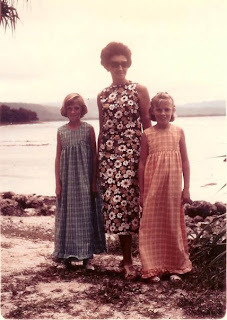 Reader Belinda sent in this picture of her gorgeous mom in a handmade floral dress (between two little ghosts from the Shining) in Vanuatu--near New Guinea. "She was and still is a very stylish lady and actually did do modelling in her younger days and make all of our clothes." Meanwhile in over in the Ukraine, Oleksandra Korobova's mom donned pretty much the exact same dress. "I found this shot in an old family album. 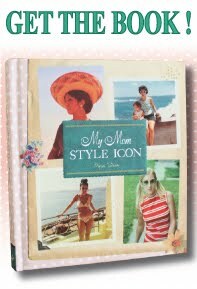 It dates back to late 70's (1979, most likely) when my mom Olga Romanova (with her mom) was 17–18 years old and about to graduate from high school." Please Fed-Ex the dress to Brooklyn next. I don't care what that no-good Alexis Bledel tells you, it's my turn. How come moms from the 40's, 50's and 60's (I assume the first mom in this post dates from the latter) knew how to pose, while I always look like I'm about to sneeze, even though I went to charm school as a tot? Maybe its something in the water nowadays. Or, it was something in their water back in those days. Hi there, I used to work for Chronicle and found out about your blog through their FB post. I really dig what you're doing--AND my 4-year-old daughter's name is Piper, and is super into fashion and crafting her own bizarre outfits that somehow look great. I can only hope she refers to me as "stylish" (or at least, "nice") when she grows up. 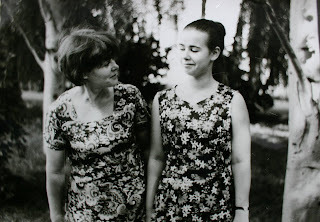 Meanwhile, I'm going to scrounge up a photo for you, of my 60s mom in her tri-color zipper top. oooh another piper! i love it. yes send me pictures! Y'all don't want to mess with pitchers of my mama. She look like she bout to cuss out everyone in the room in each one of them, LOL! wow, what a cool coincidence!